This weekend was the youth waterfowl hunt in New York State. Youth were given the opportunity to hunt ducks and geese with an adult mentor in advance of the general waterfowl season. Some local organizations offered programs to support the youth hunt, like 4-H Shooting Sports Hunting and Wildlife Program and Montezuma’s Youth Conservation Waterfowl Hunt. Congratulations to all the kids that connected with birds and the adults that mentored them! 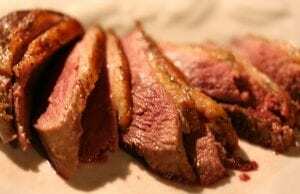 Here is a tasty way to serve up some duck. Mix 2 cups of water with 2 Tbsp. of pickling salt, a few black peppercorns (or 1 tbsps. of a pickling spice mix), and a handful of parsley or celery leaves if handy to create a brining solution in a glass or ceramic container. Add the duck breast, making sure it is all submerged in the brine. Set aside while you prep the other ingredients. 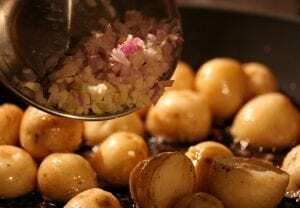 Parboil the potatoes for about 5 minutes. 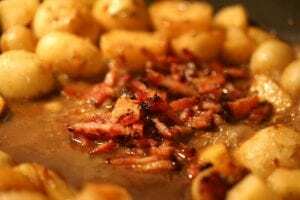 In a large skillet, cook the bacon until crisped over medium high heat. Remove the bacon to a paper towel. Add a touch of olive oil to the bacon grease to equal about 2 Tbsp. of oil/bacon grease in the skillet. Remove the duck breasts from the brine and pat dry. 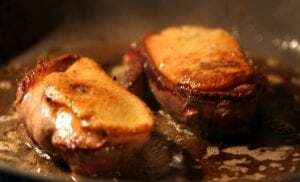 Place duck breast skin side down in the hot oil and sear the meat for 3 minutes until the skin is golden brown. Flip meat and sear the other side until browned. Remove the duck to a plate and loosely cover with foil. 5. 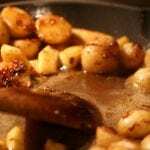 Add parboiled potatoes and cook for a few minutes to start to brown. Add garlic and minced shallot to the pan and cook a few minutes more. 6. Add a splash of vermouth to the pan and/or the apple cider and stir up any browned bits on the bottom of the pan. Cook a few minutes and then add the duck breasts back to the pan and diced apples. 7. Cover and cook about 3-5 minutes. Season with salt and pepper to taste. 8. Remove the duck and place each breast half on a plate and slice thin for serving. 9. Chop up the cooked bacon and stir it into the potato mixture. 10. 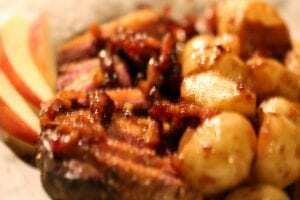 Spoon some sauce onto the duck, place the potatoes around the duck, garnish with some apple slices and enjoy!